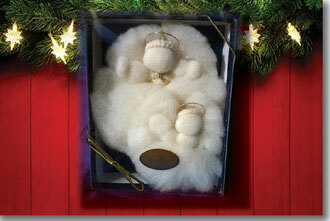 These soft guardian angel ornaments are individually crafted here at the farm from natural unspun wool. They have a delicately braided halo and are approximately 3" tall. They are available in natural creamy white. Retail price is $8 for the 3" size. Also available in the larger 6" size for $12, which makes a nice topper for a Christmas tree. We also offer a "Mother and Child" set with one large and one small angel for $15. All make wonderful holiday presents or decorations for your tree. To order, email us or phone the farm at 207-457-1435.